"Where there is hope, there is faith. Where there is faith, miracles can occur." I think my favorite thing and word in the world is hope. When you have hope, it feels like anything can be possible. That the best is yet to come, that anything that is crashing down can be picked back up. This year has been very hope-filled for me. It's nearing it's end, and I'm realizing that the hope I sustained throughout the past 12 months lead me to where I am now: to the people I met, to doing the things I am currently doing, to making the realizations I've been making. And I am so thankful for that! 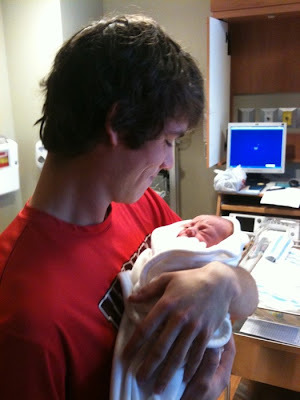 My family's close friends (and my brother's baseball coach) had their first child this past Saturday! Cade Ryan Young was born at 5:53 p.m. and he is the tiniest guy ever! Chris and Misty have had ups and down trying to have children, and after what seemed to be the longest journey ever, little Cade was born. I don't know their personal beliefs, but for me I have to believe that there was a fair amount of hope in their hearts after going through the trials and tribulations they went through. And when you have hope, there comes faith, something that gives you peace when things aren't peaceful and joy when things aren't joyful. And when you have faith, miracles happen! And little Cade is definitely a miracle. Have hope, keep the faith, and share the love.